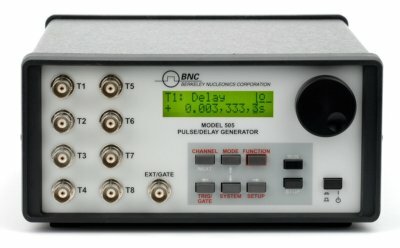 Model 505 expands the previously established boundaries of antiquated pulse generating equipment by adding 8 independent channels, multiple modes of operation, and 16 different edges into a single instrument. 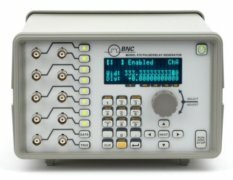 As a pulse generator model 505 provides rate, delay, width, and output adjustability with each channel. 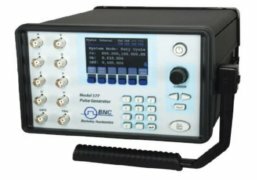 As a digital delay generator, model 505 provides fine resolution, timing, and low jitter. By allowing external, internal, and 3rd party software to control the 505 this Digital Delay and Pulse Generator can address many application specific requirements. The outputs are synchronized to one another with coherence of 5 ns. A channel’s timing can be referenced to any other channel or to the zero delay point (To) The edges are adjustable in 10 ns steps. Channels can be selectively gated, enabled / disabled. Each channel possesses separate output level and polarity characteristics along with system level gating capability. Model 505 provides the ability to store custom parameter settings which are able to be recalled for later use.